Danny Goldberg and Kurt Cobain attend the 1993 MTV Video Music Awards, at the height of Nirvana's fame. A new book reveals that Cobain was far more in control and calculating about the band's success than his public persona suggested. The book, Serving the Servant: Remembering Kurt Cobain, is written by Danny Goldberg, Nirvana's manager during the band's era-defining run. Serving the Servant begins with Goldberg's first meeting with Cobain and his two bandmates, Krist Novoselic and Dave Grohl. It was 1990, and at the time, Nirvana was still an obscure punk band looking for management and a new record deal. But Cobain surprised Goldberg with his ambitions. "For the first part of that meeting, he hardly said anything. Krist did a lot of the talking. Then, at one point, I asked them, 'Do you want to stay on the indie label?' — because you never know with punk bands," Goldberg remembers. "And Kurt suddenly piped in, 'No.' Making it clear that he knew what he wanted, that he wanted to leave the indie and be on a major, and it also made it clear to me that he was the boss." As Goldberg tells it, Cobain proved himself to be the boss time and time again. "Kurt wrote the songs, he was the lead singer, he was the lead guitar player, he storyboarded the videos, he designed the album covers and he made the decisions." Goldberg argues the reason Cobain was able to make Nirvana stand out at a time when grunge was taking over rock music — and pop culture at large — is because Cobain had the ability to "combine what he liked best about several genres and fuse them into one coherent identity. ... Culturally, he was deeply influenced by the American punk rock scene of the '80s, but he also had a great appetite for pop," Goldberg says. "All of the guys in Nirvana did. They all loved the Beatles. And it was like a guilty pleasure, they would coyly call it the 'B word.' "
Cobain also liked classic rock groups like Led Zeppelin or Aerosmith, minus the macho lyrics and peacocking. "He was determined to subvert the clichés of the macho frontman and to convey a sensitive, compassionate way of rocking hard," Goldberg says. Goldberg remembers that besides this subversive element, Cobain possessed a "comprehensive, crystalline understanding" of how to connect and resonate with large audiences. Cobain knew how to communicate across different mediums — music videos, interviews, album artwork — and wanted Nirvana to be a global sensation. "He had an exquisite sense of balance of how to stand for something without being boring, how to be entertaining without being shallow," Goldberg says. "He was almost kind of 24/7 reinventing this Kurt Cobain persona." But even with the expertly-crafted persona, Cobain openly struggled with addiction. 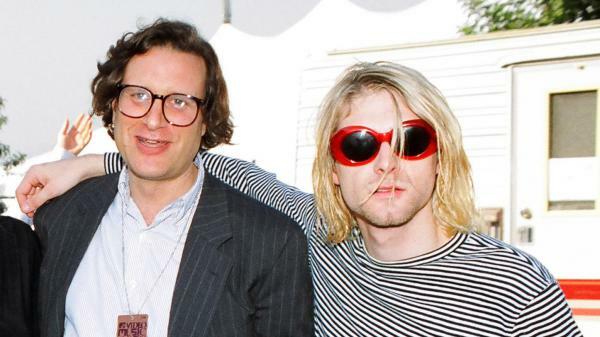 Goldberg says the first time he realized Cobain was addicted to heroin was in January 1992, when Nirvana first performed on Saturday Night Live a few months after the band released its breakthrough album, Nevermind. Shortly after, Goldberg, along with a group of six or seven others, staged an intervention for Cobain and his wife, Courtney Love, to get treatment. Goldberg says the week they did that first intervention, the couple got another surprise. She was pregnant. Goldberg says Love stayed clean for rest of her pregnancy, but just before the couple's baby girl, Frances, was born, Vanity Fair published an article alleging that Courtney Love used drugs throughout her pregnancy. It became a huge scandal, and the couple nearly lost custody of their child. "It was just so humiliating and terrifying to have to go through and caused a certain level of anxiety that often bordered on paranoia about the media," Goldberg says. Although Goldberg says the first intervention did work, Cobain slipped back into using drugs. Goldberg, Love and others attempted another intervention in 1994, but Cobain refused to stay in rehab. Cobain killed himself in April of that year. Goldberg was in a meeting in New York when he got the call. "I loved him very, very much," Goldberg says. "How close you were depended on which day the week, and which hour of the day. There were times when we really had a brotherly kind of intimacy, and there were times when he would have an opaque look in his eyes and I couldn't get through to him." Though he deems himself an "unreliable narrator" because of his close relationship with Cobain, Goldberg calls Serving the Servant a love letter to the artist and a deep appreciation for all that he stood for. "I make no bones about it," he says. "I'm talking from the point of view of really admiring, loving the guy." Today we are marking the life of a rock 'n' roll icon. Kurt Cobain died 25 years ago today after a short and brilliant career. From 1991 to 1994, his band, Nirvana, was one of the biggest in the world. NIRVANA: (Singing) With the lights out, it's less dangerous. Here we are now, entertain us. MARTIN: At the height of his fame, Cobain sometimes seemed like an unwilling participant who had been just swept up and carried away by Nirvana's success. But a new book reveals that Cobain was far more in control and calculating about the band's success than his public persona suggested. He was smart. He was savvy, ambitious, and he wanted Nirvana to be a global sensation. The book is called "Serving The Servant," and it's written by Nirvana's former manager, Danny Goldberg. He met Kurt Cobain and his two bandmates in 1990. At the time, Nirvana was an obscure punk band from Washington state. They were looking for management and a better record deal. DANNY GOLDBERG: Well, for the first part of that meeting, he hardly said anything. MARTIN: He knew what he wanted. GOLDBERG: ...That he knew what he wanted, that he wanted to leave the indie and be on a major. And it also made clear to me that he was the boss because, although they were three amigos who shared a vision, Kurt wrote the songs. He was the lead singer. He was the lead guitar player. He storyboarded the videos. He designed the album covers. And he made the decisions. NIRVANA: (Singing) Sell the kids for food. MARTIN: You frequently describe Kurt Cobain as a creative genius. Can you talk, though, specifically about what you believe made him so extraordinary? MARTIN: (Laughter) Right, because it wasn't indie enough. It wasn't cool enough. GOLDBERG: Yeah, and it was older. It was hippie generation. GOLDBERG: And Kurt also admired a lot of the music of heavy metal. He didn't like the macho lyrics and the posturing. He was determined to subvert the cliches of the macho frontman and to convey a sensitive, compassionate way of rocking hard. NIRVANA: (Singing) He's the one who likes all our pretty songs, and he likes to sing along. And he likes to shoot his gun, but he don't know what it means. GOLDBERG: He also had this comprehensive, crystalline understanding of all the other aspects of connecting with a mass audience. Again, he paid a tremendous amount of attention to the videos and the artwork. He did hundreds of interviews. And he had an exquisite sense of balance of how to stand for something without being boring - how to be entertaining without being shallow - that he thought about a lot. He was almost kind of 24/7 reinventing this Kurt Cobain persona. There were things about fame that he didn't like, and he had personal demons which are widely known. But the success that he had happened on purpose, not by accident. MARTIN: When did you realize that he had an addiction problem? GOLDBERG: I know the exact time because a lot of us realized it around the same time, and it was in January of '92 when the band did "Saturday Night Live" for the first time. KURT COBAIN: Come on people, now. Smile on your brother. Everybody get together. Try to love one another right now. MARTIN: I remember them (laughter). GOLDBERG: ...Of articles by journalists who'd seen him a couple of weeks earlier. And it was very clear they were implying that he was on heroin. And then I saw him, and he was stoned a lot of the time that night. NIRVANA: (Singing) Got to find a way, a better way. I'd better wait. GOLDBERG: We scheduled an intervention with him and Courtney. MARTIN: His wife - Courtney Love, his wife. GOLDBERG: And six or seven of us confronted them and prevailed upon them to get treatment. MARTIN: Goldberg says that week they did that first intervention, Kurt and Courtney got another surprise - she was pregnant. Goldberg says she stayed clean for the rest of her pregnancy, but just before the baby girl was born, "Vanity Fair" published an article alleging that Courtney Love used drugs throughout her pregnancy. It became a huge scandal, and the couple nearly lost custody of their child. GOLDBERG: It was just so humiliating and terrifying to have to go through, and caused a certain level of anxiety - that often bordered on paranoia - about the media and an awareness of the level of scrutiny of Kurt's personal life that he hated. MARTIN: Did you ever have any indication that he was someone who was in emotional crisis - suicidal? GOLDBERG: Oh, sure. Oh, well, he was definitely - he was prone to depression, everybody around him knew that. And he had this struggle with heroin which didn't end after he got clean. I mean, that first intervention did work, and he was clean for many, many months after that, but not for the rest of his life, obviously. MARTIN: Danny Goldberg, along with Courtney Love and others, attempted another intervention, but Cobain refused to stay in rehab. And on April 5, 1994, he shot himself. Goldberg was in a meeting in New York when he got the call. GOLDBERG: I loved him very, very much. You know, how close we were depended on which day of the week and which hour of the day. There were times when we really had a brotherly kind of intimacy, and there were times when he would have an opaque look in his eyes and I couldn't get through to him. MARTIN: I don't know if reverence is the right word, but even in the book, you acknowledge that you looked at Kurt Cobain and his career through sort of rose-colored glasses. And you're unapologetic about it. You just say, listen, I love this guy. I think he was a genius. And that's what this book is. GOLDBERG: ...Because I'm talking from the point of view of really admiring and loving the guy. GOLDBERG: Danny Goldberg is the former manager for Nirvana. His new book is called "Serving The Servant." NIRVANA: (Singing) I'm so happy. Transcript provided by NPR, Copyright NPR.